Archery hunting is what we do best at, The Lodge at the Lake llc. Every hunter has exclusive access to our 3D target range. The 3D target range is designed to give our archery hunters the best realistic target practice feel. The range is 25 yards to targets with an earth mound stop that has a slight slope down to the target area. We have made sure to keep that, “in the woods feel”, for target practice by having a foliage target background in front of our earthen backstop. You can be happy knowing that we understand that when fine tuning your bow or crossbow even the most experienced hunters arrow or bolt can go astray. Such ease of access to bolts and arrows with the smell and feel of already being in your stand or blind you will only find at The Lodge at the Lake llc. The Lodge at the Lake llc provides selectively placed stands for our archery hunting guest. Our guides spend the summer finding the best placement for deer movement on your personal private hunting land. We like to make sure our experience is top rate and hassle free. With decades of experience in their quivers, our guides have made sure the trails and stands are optimal for hunting the big bucks of Ashtabula County. ​The Loge at the like is always looking to improve your hunting experience in Ashtabula County. Knowing how hunting is always more preferable warm and dry, especially your crossbow, we provide the newest in outdoor conveniences. 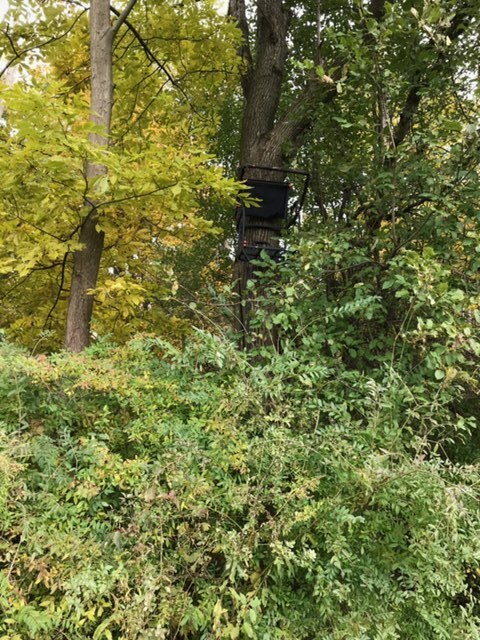 Our guides and specialist in hunting the Ashtabula County area and The Lodge at the Lake llc have taken special care in the placement and locations of our stands and blinds. Here is a great view of your state of the art hunting blind including views from the inside out. As you plan your stay with us, you can make arrangements to hunt some of the close by public lands as well. The Lodge at the Lake llc understands that a large group of hunters like their space, so while you stay with us you will have the opportunity to hunt the weekend or even the week and more with plenty of hunting options available through The Lodge at the Lake llc. During your stay with The Lodge at the Lake llc you will find that Conneaut and also Ashtabula Harbor offer a wonderful dining and entertainment while on your off hours from the Archery Hunt. After a great day in the woods waiting for that perfect buck you may just want to relax at The Lodge at the Lake llc and take it easy and that is a great idea. While enjoying your excellent choice in hunting and staying with us, you will get all the extras as well; a fully functioning kitchen with a 30 x 30 patio right out the large sliding glass door. Or maybe it’s a game of pool with the guys by the wood burning stove downstairs next to the large entertainment room. We bet it’s the Jacuzzi tub that calls you after the woods!